Actually I suppose it began several hours ago when I woke up at 3am to catch a bus to the airport. Stupid 3am. The bus was fairly decent though. I might make that a regular thing, even my for business travel. Anyway fast forward a few hours and I find myself sipping coffee in the Detroit Airport, killing time during my five hour layover before I can catch my flight to Frankfurt. Frankfurt Germany that is, because oh yeah, I'm going to Europe. 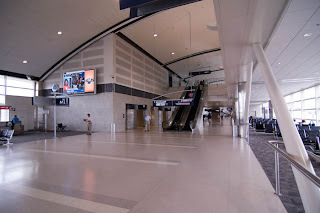 When I lived and worked in Michigan I was in and out of the Detroit airport on a regular basis, as were many of my colleagues. Because of this I was on the lookout for people that I might know... and wouldn't you it in the last 30 minutes of my 5 hour layover I ran into a woman I used to work with. Somethingsomethingsomething small world isn't it.